(TibetanReview.net, Feb10’19) – In its ongoing move to Sinicize all aspects of Tibetan life, China has imposed all manners of restrictions on this ethnic minority group’s celebrations of Losar, its traditional New Year, while began on Feb 5 this year. 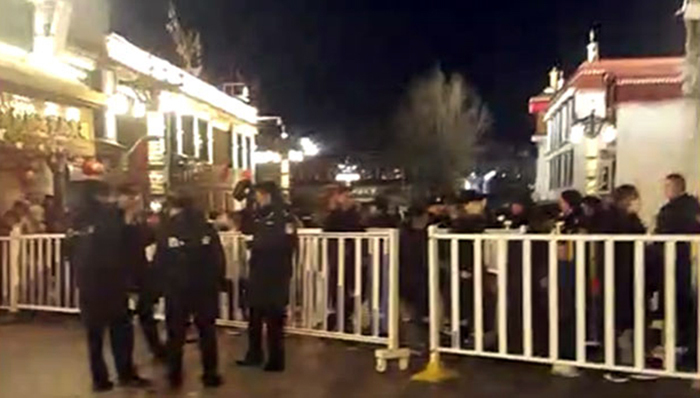 In Tibet’s capital Lhasa, police filled the streets and government workers were forbidden to visit monasteries, reported the Tibetan Service of rfa.org Feb 8, citing Tibetan sources. This year’s Losar was preceded by public speeches by Chinese officials urging Tibetan loyalty to Beijing and denouncing Tibetan government workers caught “harbouring religious faith and worshipping in secret,” one Lhasa resident was quoted as saying. In Markham County of Chamdo City, Chinese police were reported to have been sent into Tibetan neighbourhoods “to assess the mood of the people and the situation on the ground, while in the city itself a clampdown was imposed to prevent “possible incidents”. Likewise, Tibetans working for the Chinese government offices were stated to have been barred from visiting monasteries to offer worship during Losar. However, many were reported to have defied the order and visited monasteries on the third day. And in Serta County of Sichuan Province, Tibetan government workers were required to report to work during the traditional holiday “so that they can’t go back to their hometowns for the traditional Losar celebrations,” the report quoted a source as saying. Some were stated to have been given only a short break from work, including only before, and not during, Losar in some cases. “My own family members wanted to come from Lhasa to visit us in Chamdo but did not get holiday permission from their department until just the day before Losar,” the report quoted an unnamed woman as saying. And they could not make the trip as the travel companies were all closed by then. This year’s Losar fell on the same day as the Chinese Spring Festival.